At Flutter FETTI, we carry a wide variety of unique wedding and bachelor/bachelorette themed-confetti. Whether you want to have a “blast” at your bachelor/bachelorette party, create a beautiful, all-white cascade of Flutter FETTI as you walk down the aisle, or give your guests an interactive way to send you off in style, you’ll love our exquisite wedding supplies. We Can Accommodate Weddings Large & Small! 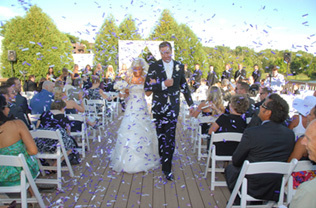 At Flutter FETTI, our wedding confetti and launchers are designed for events of all sizes! Whether you want to make a big entrance, or if you need something that can make a dramatic impact inside a reception hall with low ceilings, you’ll find it when you shop our unbeatable selection of confetti and launchers. Browse through our assortment of handheld confetti flick sticks, mega blaster confetti launchers (which require Co2 and additional accessories) and continuous flow gerb launchers to find the perfect for your event/venue. Allow Your Guests to Get Interactive! Our handheld flick sticks are a popular favor at weddings. The ready-to-use tubes are designed to easily fit inside a purse or a man's jacket pocket, and they’re a fun and exciting alternative to rice, rose petals, and bubbles. All of our tissue wedding confetti is biodegradable and flame-retardant, so you can safely use it during both indoor and outdoor ceremonies/receptions. Our Flutter FETTI is available in a wide variety of colors. Go for an elegant all-white look, or custom order your FETTI so that it coordinates seamlessly with your wedding/party theme! The Flutter FETTI Team is here to help make your wedding spectacular! Flutter FETTI’s wedding confetti and streamers truly make magic and memories. 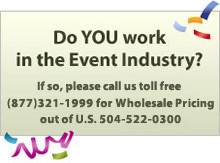 Contact one of our Confettiologists Toll-Free at (877) 321-1999 for customized wedding suggestions today! If have any questions about our wedding confetti products, or you you’re interested feel free to Get A Quote today! WARNING: Do not point, flick, or fling toward anyone when using. Some Flutter FETTI products, when saturated with any liquid and under pressure may bleed color, and Flutter FETTI® cannot guarantee or warranty that it will not do so. If any liquid will or may be present at an event, please consult with us so we can assist you in choosing water-safe FETTI® products. The Wedding Confetti tissue is flame-retardant and biodegradable. Our confetti for weddings, bachelor parties, and bachelorette parties works well in reception halls with low ceilings and at bachelorette parties in someone's home. These are lovely, exquisite wedding supplies your attendees will cherish. Die Cut Metallic Stars by the Pound - 2"